To be eligible for a Best Law Firm ranking, a firm must have at least one lawyer included in The Best Lawyers in America©. Attorneys are neither required nor allowed to pay a fee to be listed. Founder and managing partner Jeffrey M. Williams and partner Susan J. Smith were selected by their peers for inclusion in the 2018 edition of Best Lawyers. Best Law Firm rankings have been produced every year since 2009, when Best Lawyers partnered with U.S. News & World Report to produce its first comprehensive rankings of nearly 20,000 U.S. law firms. 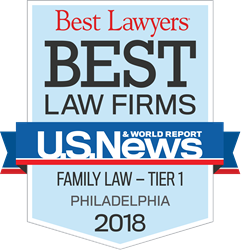 Williams Family Law is proud to have been named among the Best Law Firms every year since 2012. Williams Family Law, P.C. – Williams Family Law, P.C., is a premier family law firm based in Bucks County, Pa. The firm provides individuals with matrimonial and family law legal counsel and representation in alimony, child support, child custody, divorce, domestic partnership and cohabitation, grandparents’ custody rights, equitable distribution, marital settlement agreements, prenuptial and postnuptial agreements, separation agreements, spousal support, matrimonial taxation and related matters. The family law attorneys also provide guidance and representation in alternative dispute resolution forums, handling mediation, arbitration and custody dispute resolution. The practice at Williams Family Law centers on four core principles: experienced guidance, compassionate advice, powerful advocacy and knowledge of the local courts and counsel. The firm prides itself on leadership within the profession and a strong record of success. To learn more, visit http://www.bucksfamilylawyers.com or email questions(at)bucksfamilylawyers(dot)com.